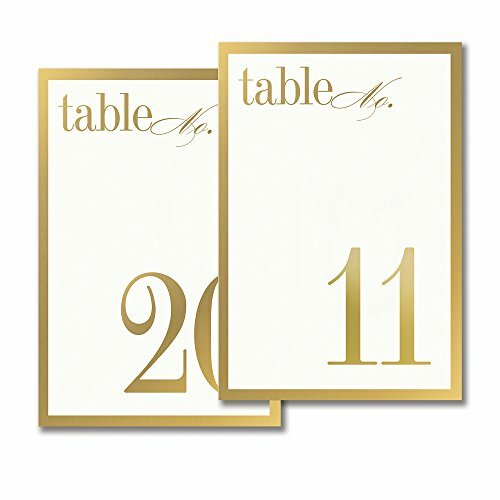 Vera Wang 11-20 Gold Bordered Table Cards by Vera Wang at LDP Graphic Design. MPN: B60751. Hurry! Limited time offer. Offer valid only while supplies last. Classic Vera Wang, this table card-bordered in gold with flourished type-is the perfect choice for the sophisticated soiree with a touch of romance. Classic Vera Wang, this table card-bordered in gold with flourished type-is the perfect choice for the sophisticated soiree with a touch of romance. This tented card coordinates with our Gold Border Invitation.